For senior biochemistry and biotechnology major Victoria Rogers and fellow University of Missouri–St. Louis students, the new Science Learning Building on North Campus most notably provides all new laboratories and high-tech equipment. 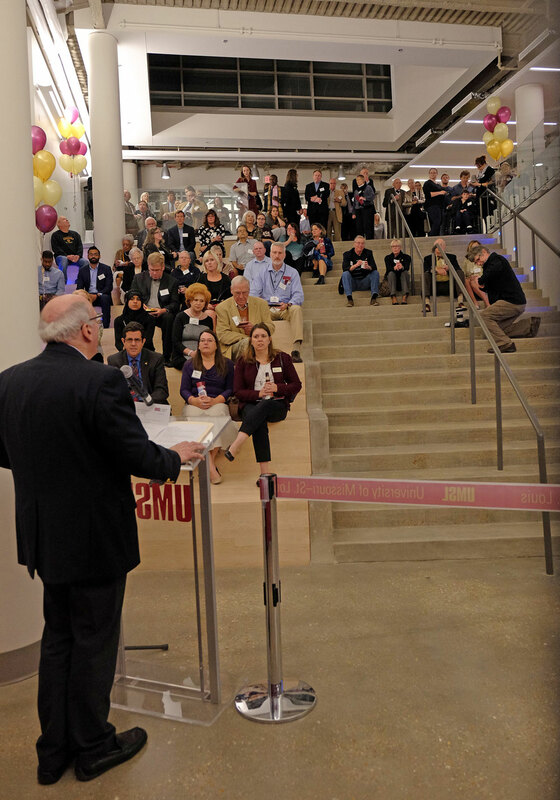 Nearly 300 attendees of the grand opening poured on to the steps and back into the halls of the new Science Learning Building as College of Arts and Sciences Dean Ron Yasbin addressed the crowd in the solarium area of the “Town Center,” which connects the SLB to Benton and Stadler halls, forming the science complex. With 18 new laboratories, all new study areas, a solarium “Town Center” connecting the building to the Benton-Stadler science complex and the addition of a Sodexo Simply to Go Café, the Science Learning Building has everything students need to call it their academic home. Even Chancellor Tom George expressed some gratitude for closer coffee. But as excited as George was about that, he was even more thrilled for the much-improved space the building provides for science learning. 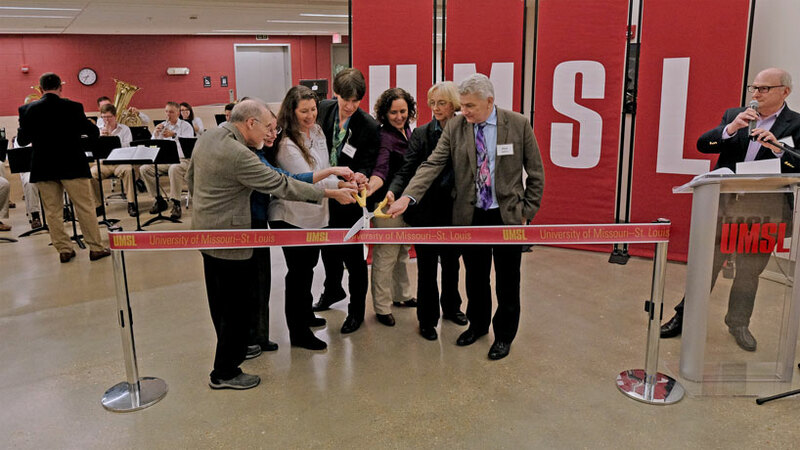 Nearly 300 attendees of the opening got to witness the traditional ribbon cutting alongside nifty experiments during their tours of the four-story, 75,000-square-foot facility. One such experiment was by students of Professor and Chair of the Department of Physics and Astronomy Erika Gibb. They demonstrated how the current from falling water could create enough charge to cause a small light bulb to flicker. And while tours were happening, actual learning was taking place, too. A biology laboratory class was in session, and grand opening attendees even got to witness cell and molecular biology doctoral student Kimia Kajbaf prepare petri dishes for undergraduates to observe nematode mutants in a class scheduled for later that evening. The Science Learning Building is four stories and 75,000 square feet, with 18 labs, seven new study areas, a solarium and a new Sodexo Simply to Go Café. Recognizing the need for the new Science Learning Building, UMSL’s University Assembly Budget and Planning Committee recommended using internally reallocated funds to finance construction bonds over a 30-year period for the $35 million project. The internal money became available when an expected cut in state funding did not materialize. George considered it a “must-do” to improve the science learning facilities at UMSL, which he said previously paled in comparison to even some local high schools. College of Arts and Sciences Dean Ron Yasbin went beyond the sciences, considering how the building will help shape non-science majors as well. 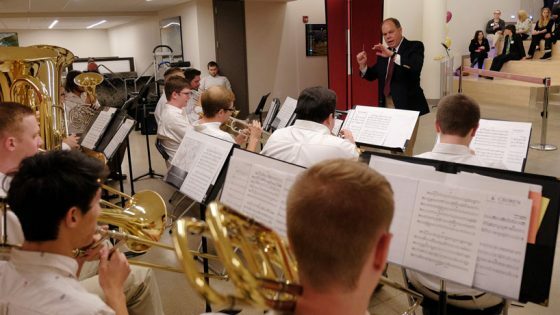 Associate Teaching Professor of Music Education Gary Brandes conducts the UMSL Brass Ensemble as they perform for the grand opening of the Science Learning Building. The performance marks the integration of the arts and sciences at UMSL, a key movement of the College of Arts and Sciences currently. Arts performances will continue to play in the new science building via large screen monitors to be mounted at a later date. 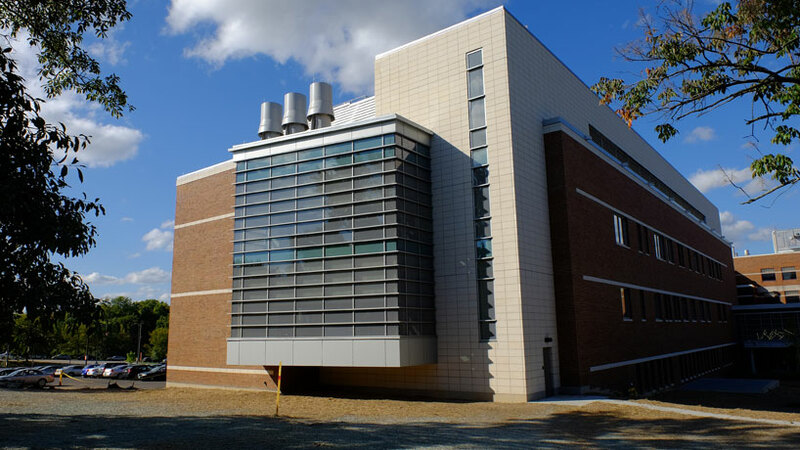 An accompanying building in the science complex, Benton Hall, will now begin its season of maintenance and repair thanks to the new elbow room the SLB provides for temporary rehousing of science departments and classes. George no­­ted that Benton and Stadler halls are the oldest university-built buildings on campus. The repairs come thanks $25 million in state, University of Missouri System and UMSL funding. But for now, students are simply happy for the new building they have.